With about 1700 trade marks spanning a period of nearly 100 years, Symbols of Australia traces the dawning and development of industrialisation and mass consumption that coincided with the nation’s own infancy. First published in 1980, the book presents a decade-long project of graphic archaeology – an illuminating archive that grapples with issues of national cultural heritage and identity. Australia at the time was still an institutionally racist place. The early genocide and continued ethnocide of Aboriginal people had initiated the fledgling country’s strategy towards national unity. The cultural values of British colonialism were imposed as ‘natural’ and ‘superior’, and enforced through the homogenising policies of segregation or assimilation for Aboriginal Australians, and the ‘White Australia Policy’ for immigrants. The Cozzolinos arrived in Australia a few years after this policy’s main administrative tool, the ‘dictation test’, had been abandoned in 1958, but well before the policy itself was ditched in 1973. The test had been designed to keep out Asian immigrants, but had also been used arbitrarily to bar entry to eastern and southern Europeans, or anyone at all deemed an ‘Undesirable Immigrant’. The book is divided into two parts and fifteen chapters. 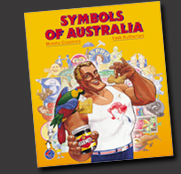 ‘Book i: Reflections’ has chapters such as ‘All Under one Roof’, which deals with the Australian landmass as graphic symbol; ‘Dinkum Bonza Coo-ee’ presents visual interpretations of local lingo; ‘Famous since Captain Cook’ collects images of Aboriginal culture exploited by commerce; and several chapters titled ‘Native Companions’ parade symbols of the country’s fauna and flora like a visual inventory for an Aussie ark. ‘Book ii: Observations’ tackles industrial imperatives in ‘The Half Back’; the market for agricultural products in ‘Don’t Worry’; every conceivable foodstuff in ‘Eatmore’; and so on, including chapters representing cleaning products, clothing and recreation. The characters and scenarios in Symbols of Australia are as paradoxically strange and familiar as anything Alice encountered down the rabbit hole. Many Australians will recognise with both affection and repulsion their own image in the assembled iconography. The macho, larrikin male is a pervasive cultural presence, represented by anthropomorphised kangaroos that box, whip, shoot and fly, as well as the digger / bushman, the Chesty Bonds Man, and plenty of others. The increasingly tenuous national myth of egalitarianism or ‘a fair go’ is more broadly represented by the class origins of many of the mascots and characters. And there are plenty of jokes and puns (where are the jokes in logos nowadays?). The already mentioned myth of racial and cultural superiority is manifested in extraordinary symbols of exploitation, prejudice and hate towards indigenous Australians. Nulla Nulla is ‘Australia’s white hope, the best household soap.’ The product’s logo is a venomous personification of an Aboriginal woman as dirt. A white hand hits the crudely drawn black head with a spoon, and the image is framed by the phrase ‘knocks dirt on the head’. Just in case we missed the point the word dirt hangs around the woman’s neck. So does all this really add up to a portrait of a ‘lucky country’ ‘down under’? And what of graphic design’s relationship to it? The book leaves little doubt about contemporary graphic design’s genealogy. Like a hypnotherapy patient exposing formative experiences, the birth of design into the service of capitalism is clear. The collected trade marks, a genuinely representative sampling of the iconography produced at the time, rarely promote anything other than commodification. Very few of the symbols belong to broader public institutions, programmes or campaigns, for example. Even in the advertisers’ hungriest fantasies, social reality was never this narrow: therefore what is exposed is either a constricted culture, or a restricted craft. What was once commercial art is now graphic design. What was once a brutal penal colony is now a diverse, thriving multicultural nation. Both the national culture and the craft of graphic design have come a long way. They remain flawed but promise the opportunity of creating a better future from a re-imagined past. When Cozzolino first visited the Federal Government’s Australian Archives bunkers in Canberra, which held the trade mark registers from the Australian Colonies before 1901, nobody had ever requested access to this material. Symbols of Australia opened these vaults, and it remains a useful historical testimony.